ACT mammal emblem poll: Eastern Bettong or Southern Brush-tailed Rock Wallaby? The Brush-tailed Rock Wallaby is one of two choices for the ACT mammal emblem. File photo. 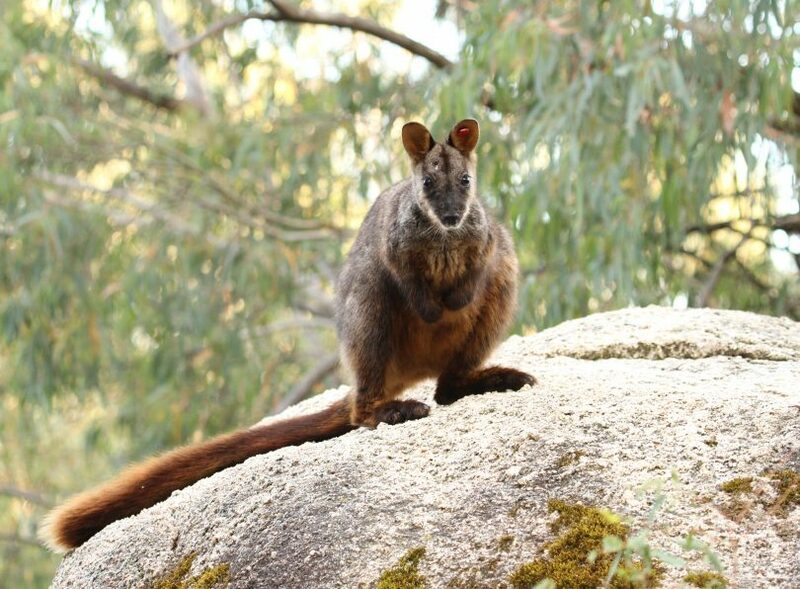 Would you rather have the Eastern Bettong or the Southern Brush-tailed Rock Wallaby as the ACT’s mammal emblem? The shortlist is in and it’s goodbye to the Echidna, the Little Forest Bat, the Spotted Tail Quoll and other contenders and now down to Canberrans to decide which of these two endangered mammals will make the grade. An online poll is now open and will run until June 26 with anyone living in the ACT able to vote. 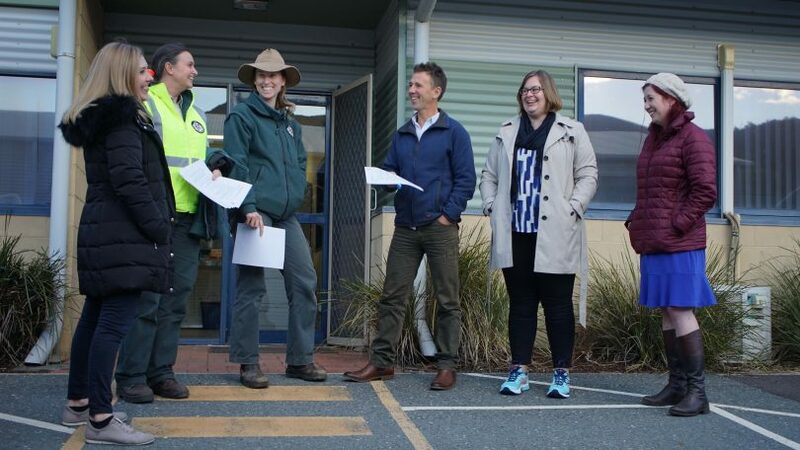 The Legislative Assembly’s Standing Committee on Environment and Transport and City Services arrived at their shortlist of just two mammals after taking submissions on the topic and visiting wildlife experts at Mulligans Flat and Tidbinbilla. “The Committee heard from ecologists about the contribution the Bettong and Southern Brush-tailed Rock Wallaby are making to the ACT’s natural environment and we believe these two mammals are strong contenders to become the ACT mammal emblem,” said committee chair, Suzanne Orr MLA. The Eastern Bettong is the other choice for the ACT mammal emblem. File photo. The committee was tasked with looking into whether the ACT should have a mammal emblem because we are the only state or territory without one. While NSW is home to the platypus emblem, Queensland has the koala, and South Australians love their hairy-nosed wombats, the ACT has long been missing out. The Committee pictured at Tidbinbilla Nature Reserve last month. From L-R: Candice Burch MLA, Dr Jennifer Pierson, Senior Wildlife Manager; Nicole Hill, Wildlife Officer; Peter Cotsell, Regional Manager of Southern Parks and Reserves; Suzanne Orr MLA; and Tara Cheyne MLA. Photo: Supplied. The committee’s first task was to consider whether the ACT should have a mammal emblem or not. It received 29 submissions in total – all supporting the idea of having the emblem. The submissions came from a wide variety of people and organisations and suggested a range of animals to be considered for the mammal emblem. Students from Preschool to Year 2 at Franklin Early Childhood School were keen for the Eastern Bettong to get the guernsey, while Scouts ACT wanted the Echidna and Tyler Williams thought it should be either the Tiger Quoll or the Eastern Grey Kangaroo. The Woodlands and Wetlands Trust outlined a series of reasons for the Eastern Bettong to be chosen including the need to highlight the plight of this endangered species, while the students from Year 3 and 4 at Aranda Primary wrote a whole range of letters on which mammal they thought should be selected. Ms Orr said that when choosing a shortlist of mammals for the online poll, the Committee considered the following factors: the animal’s connection to the ACT region, its contribution to the local environment, classification as ‘vulnerable’ or ‘endangered’, and the potential for publicity as the Territory emblem to contribute to important conservation efforts. In an article written for The RiotACT in February, Ms Orr said: “the adoption of a mammal emblem is more than just the chance to talk about a cute critter”. The online poll is now open at https://www.surveymonkey.com/r/MammalEmblemACT and the committee is due to report to the Assembly on the Mammal Emblem Inquiry by September 2018. For more information or to see the submissions to the Inquiry please click here. Maybe the Red Herring aka the tram. Vicky, Graham, how about you? Can't we have a Yowie or a Bunyip? Sorry but the other little guy looks like a Rat. I seem to have been left out of the loop on this one. I wasn’t aware that there was even a competition, and the fact that there were only 29 submissions demonstrates that not many others knew about it either. Why is it confined to mammals? Is there already an animal emblem for the ACT? The gang gang cockatoo perhaps? This is all rather strange and it appears to have been either a failed PR stunt or an attempt to appeal to children. It should be the Culled Kangaroo. ACT to get its own Coat of Arms, but what will it look like?